The City of Los Angeles provides wastewater collection and treatment for residents, businesses, and industries located within the city and for 27 contract agencies. The Terminal Island System serves the city’s southern portion. 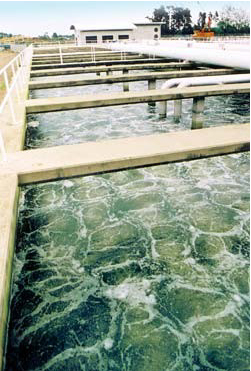 This subsystem has one treatment plant, the Terminal Island Treatment Plant, located in the Los Angeles Harbor area. This aeration tank project was developed to improve unit process control and to enhance the plant operators’ ability to control the treatment process and comply with effluent discharge requirements. It also involved designing and installing sluice gates in the walls separating each tank, replacing the diffusers/piping in the mixed liquid channel and the diffusers/piping in influent channel, replacing foam spray nozzles, insulating air headers, and installing flow meters. DRC participated in the comprehensive evaluation, preliminary design, plan production, training and start-up of various aeration tanks, which included relocating underground utilities and designing, upgrading, and installing new and existing equipment. DRC also provided preliminary design, structural engineering, and support services to improve the plant’s secondary treatment capacity. This included installing submersible pumps at the aeration basins, a monorail system to move the pumps between different basins, step feed modifications, 24-inch and 16-inch pipelines, replacing access platforms, pipe supports, equipment supports, and structural modifications to the existing concrete structures.